Last Monday, I was asked by a journalist whether a claim in a new report from a small NGO made any sense. The report was mostly focused on the impacts of climate change on food production – clearly an important topic, and one where public awareness of the scale of the risk is low. However, the study was based on a mistaken estimate of how large global warming would be in 2020. I replied to the journalist (and indirectly to the NGO itself, as did other scientists) that no, this did not make any sense, and that they should fix the errors before the report went public on Thursday. For various reasons, the NGO made no changes to their report. The press response to their study has therefore been almost totally dominated by the error at the beginning of the report, rather than the substance of their work on the impacts. This public relations debacle has lessons for NGOs, the press, and the public. 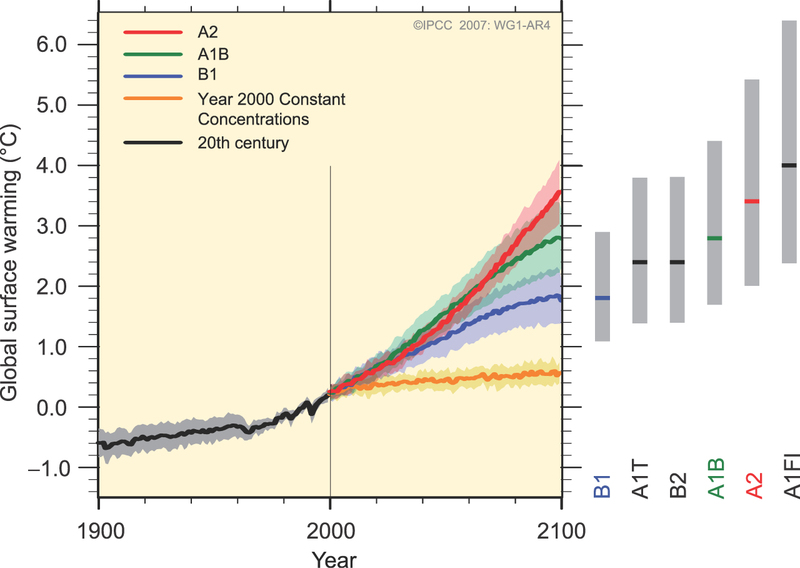 which show trends of about 0.2ºC/decade, and temperatures at 2020 of around 1-1.4ºC above pre-industrial. The claim is thus at least 1ºC above what it should have been, and implied trends over the next decade an order of magnitude higher than otherwise expected. So far so good. The different IPCC scenarios give a range of 412-420 ppm. They then calculated the CO2-eq to be 490 ppm. The forcing from 490 ppm with respect to the pre-industrial is 5.35*log(490/280)=3 W/m2. The first error is in misunderstanding what CO2-eq means and is used for. Unfortunately, there are two mutually inconsistent definitions out there (and they have been confused before). The first, used by policymakers in relation to the Kyoto protocol, relates the radiative impact of all the well-mixed greenhouse gases (i.e. CO2, CH4, N2O, CFCs) to an equivalent amount of CO2 for purposes of accounting across the basket of gases. Current GHG amounts under this definition are ~460 ppm, and conceivably could be 490 ppm by 2020. However, the other definition is used when describing the total net forcing on the climate system. In that case, it is not just the Kyoto gases that must be included but also ozone, black carbon, sulphates, land use, nitrates etc. Coincidentally, all of the extra GHGs and aerosols actually cancel out to a large extent and so the CO2-eq in this sense is quite close to the actual value of CO2 all on its own (i.e. in IPCC 2007, the radiative forcing from CO2 was 1.7 W/m2, and the net radiative forcing was also 1.7 W/m2 (with larger uncertainties of course), implying the CO2-eq was equal to actual CO2 concentrations). In deciding how the climate is going to react, one obviously needs to be using the second definition. Using the first is equivalent to assuming that between now and 2020 all anthropogenic aerosols, ozone and land use changes will go to zero. So, they used an excessive forcing value (3 W/m2 instead of ~2 W/m2). The second mistake has a bigger consequence: is that they assumed that the instantaneous response to a forcing is the same as the long-term equilibrium response. This would be equivalent to a planet in which there was no thermal inertia – or one in which there were no oceans. Oceans have such a large heat capacity that it takes decades to hundreds of years for them to equilibriate to a new forcing. To quantify this, modellers often talk about transient climate sensitivity, a measure of a near term temperature response to an increasing amount of CO2, and which is often less than half of the standard climate sensitivity. It has to be acknowledged that people sometimes make genuine mistakes without having any desire to mislead or confuse, and that this is most likely the case here. It does no responsible organisation any good to have such a mistake in their material. It just leads to distractions from the substance of the report. The situation is serious enough that there is no need for exaggerated claims to produce headlines, just the plain unvarnished best guesses will be fine. It is likely that temperatures will reach 2.4ºC at some point in the next this century, and so the calculated impacts are certainly relevant – just not in 2020. Unfortunately, in this case the people involved did not decide to fix the errors that were pointed out, going so far as to have the PR person for the launch insist that the calculation was ok. That the Guardian journalist, Suzanne Goldenberg, took the time to check on the details is a credit to the press. The reaction can be put down to institutional inertia, combined with the fact that their scientific advisor was in hospital (and is 87). It would clearly have been much better to have had this properly peer reviewed ahead of time. To that end the AGU Q&A climate service or the Climate Science Rapid Reaction Taskforce (CSRRT) are invaluable resources for getting some quick scientific peer review. Good catch Dr. Schmidt. Thanx for this. The second mistake has a bigger consequence: they assumed that the instantaneous response to a forcing is the same as the long-term equilibrium response. This would be equivalent to a planet in which there was no thermal inertia – or one in which there were no oceans. Oceans have such a large heat capacity that it takes decades to hundreds of years for them to equilibriate to a new forcing. To quantify this, modellers often talk about transient climate sensitivity, a measure of a near term temperature response to an increasing amount of CO2, and which is often less than half of the standard climate sensitivity. If we assume the temperature records are accurate, what you have just said is that it takes a a long time for the climate to change temperature. However, we see large fluctuations up and down that are quite rapid. The GW claim is that CO2 causes a rise, so any rise is claimed to be natural variation plus CO2 effect. So for a rise we don’t know whether its CO2 or variation. However, for a fall in temperature, it can’t be CO2 since the claim is CO2 causes a rise. So the fall must be all caused by natural variation at the minimum. So looking back at falls in the temperature record we see large falls over a short perod of time. Thermal inertia is very low, not high as you’ve claimed. Now I’m confused. I understand we are currently about 0.8ºC above pre-industrial. A mean global surface temperature 1.4ºC above by 2020 implies a 0.6ºC rise over the next decade. The mistakes in the report are unfortunate. Hopefully people will look beyond that and assess the report for it’s merits. Thank you for also typing such information. For winning the opinion it is important not to encourage exaggerations but discuss Climate change balanced. Quickly picking up on mistakes like this and making it widely known what happened is the only way to defuse the denialists’ rhetoric, well done! Perhaps you can tell us why the global average temperature can drop pretty quickly? From reading your post, the claim I think you are making is that the ocean layer has a lot of inertia and that this is what is holding back the warming. Correct me if I’m wrong in my interpretation of the post. However, does the evidence back up this claim? If the inertia was there, then it acts as a strong damping effect on global temperatures. However, since we see large rapid falls on the 1-3 year timescale, it can’t be acting as a large damping effect. A fall of nearly 1C over 3 years. How can there be a large inertial effect, and still have such a drop? Two (very) minor quibbles: you say “The second mistake has a bigger consequence”, but following your mathematics, the first mistake accounts for (much) more than half of the error – about 0.75 degrees. You also said “at some point in the next century”, and that can be misinterpreted as 2100-2200. Thank you for once again pointing out that we have quite enough to be alarmed about already, without just making stuff up and inventing our own misery. Why on Earth would an NGO make their own climate projection, rather than using that provided by the experts (e.g. in the IPCC report)? There is something to be said in favor of expertise – at least experts would not make simple mistakes like forgetting about ocean thermal inertia (except Lindzen perhaps, who performed a similar calculation to prove that observed warming is a lot less than predicted). Pointing out errors and no reaction! I’m flabbergasted that anyone would try to calculate the warming from first principles before (not to say instead of) looking it up. Sometimes you need due diligence, but in this case lazy would have been a good alternative. The AAAS featured this story on their website, then pulled it when its “impossibility” was revealed, and apologized for the error. Then the next day, Scientific American has the “2 degrees by 2020” story on their website, too, but pulled it as soon as they realized it was bogus. But they have said nothing about any mistake. The article just “disappeared”. Two major scientific organizations publish an absurd paper on climate change, that everyone agrees is wrong. Aren’t scientists supposed to be “skeptical”? Now you can see why so many people don’t trust “scientific” articles on climate change. Seems to me that the double-whammy (conflating different “CO2 eq” uses and figuring on instantaneous changes) wasn’t the major problem here, the problem was not going back and correcting for the mistakes once pointed out. Now, even with the rapid response Gavin’s written up, I’ll bet certain parties are going to milk this mistake for all its worth. Nevermind that they won’t be the ones who pointed out the errors in the report, they’ll still treat it like a big scoop where they catch the “alarmists” red-handed in fear-mongering or somesuch. Could you go over that equivalent thing again? Aren’t aerosols decreasing due to regulations everywhere except asia? Isn’t there a big push to get second and third world peasants to use methane for cooking rather than dried dung directly? I understand that ocean heat capacity and the ice on Antarctica and Greenland are keeping the Earth cool, but how do you calculate the equivalent CO2 forcing caused by them? Seems like a hairy mess. 3*3/3.7=2.4ºC To get degrees C from watts/meter square you multiply by .81. Please show how you got that. Sulfates should be decreasing due to regulations. Regulations are dependent on regulators, so finding a smooth curve could be difficult. Ozone should be increasing in the stratosphere and decreasing at ground level due to the Montreal Protocol and other regulations respectively. Does this book cover the details of getting the equivalent forcing right? What is the price for a download of the book? I am very glad the reporter asked you to review the report. I am very glad you caught the error. Nice job! Thanks. Are news organisations completely corrupt? Looking at the headlines, it seems that they each just glanced at the report, then made up their own story – “Climate change could boost crops in US, China”, “Climate change to spur crop shortages, study claims”, “Food prices set to soar as world gets warmer”, “By 2020, world to be 2.4C warmer, India to be hardest hit”. Hard to believe that they are reporting the same thing. The Guardian, I felt, hit a little under the belt with its innuendo and guilt by association with the Himalayan error. Then it characterises the report as a “study”, giving it equal weight to a peer reviewed article or major review. Their headline tries to lay the blame with AAAS. Contrary to what you may have heard, greenhouse gases aren’t the only influence on global temperature. This may enlighten, especially this. Gee, Roberto@13, and who was it who corrected the error. Let me check. Why, yes, yes, it was the scientists themselves. No matter how you spin this, it’s kind of hard to say the scientists are being alarmist when they’re the ones correcting the garbage. The computer stuff you need to install or learn is linked there. Once your local library has the book, you’ll be ready to use it. Most of your questions will be answered there. I have been arguing this same point for years with denialists. I’ve got tired of the fight due to excessive numbers of them with the inability to grasp thermal inertia. So I now just say, 380ppm equals ocean levels 25 metres higher than now. It will probably be the year 4000 before it becomes that high, but that’s the real time period of thermal inertia before the planet stabilises at 380ppm. They will not get the point, if the point is against their beliefs! Absolutely. 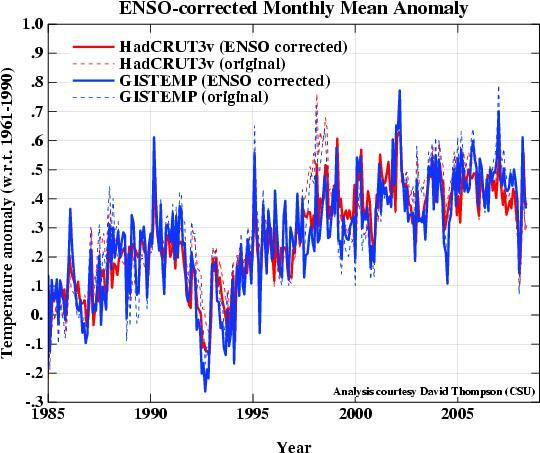 It’s also nice to not have it descend into the “another nail in the coffin of global warming” and “climate science is a fraud” narratives, which is what happens when these sorts of corrections are left to the political crowd. Keep up the good work. is a logical leap of the pretzel-shaped variety. I’m so stealing this phrase. Having read reactions to this mistake on other blogs, I can very much appreciate your taking the time to not politicize the mistake, but taking us through the steps for how it was made and how it might be prevented in the future. At least the correction became part of the story. Well done for salvaging something out of this trainwreck. Thanks for providing the needed context here. I am flabbergasted by the stubborness/stupidity of said NGO to let the document go as is even after the error was pointed out to them. Very damaging to an already dwindling reputation of climate information. I understand that people want to be sympathetic to the NGO’s larger intentions, but that shouldn’t detract from calling a spade a spade–if at least one lesson is to be learned. EurekAlert, looking duly* embarrassed, puts up email address for people to report errors in their releases. **) Well, perhaps the FEU is well known in Argentina, I don’t know. Anyway, just judging by a quick drive-by at their website, they have more of a track record dealing with the impact of summitry*** and grant allocations**** on NGOs than they have withresearching the impacts of global warming. ***) Their last big project looks to have been coordinating some Danish-funded civil-society empowerment stuff to do with the Rio+10 Earth Summit (2002). ****) And their most recent big publication (2009, also by FEU-US) was about the impact of the GEF’s RAF on CSOs,***** if you’ll pardon the jargon. *****) No, I’m not going to parse those abbreviations to sneak in just another recursive footnote. Keith Kloor: The very first quote on your own blog post contains an error*, so maybe you should be a little less hasty to throw stones, hmmm? * It confuses CO2 and CO2-equiv. Why did you point out the mistake at all? You could have simply let them run the story, let the denialists go haywire spotting the errors and then made fun of them? Or you could have let them run the story simply because it could have served the larger cause of conveying a sense of urgency? IIRC, you did not hesitate to support Ehrlichian alarmism because, paraphrasing your response, Ehrlich’s warnings of dire portents could have galvanized societal responses which in turn helped avert such crises and therefore we did not see them. Why is a small NGO doing these calculations itself anyway? Wouldn’t they be better off just using the IPCC predictions to get a range of possible warmings for 2020? This error-riddled article was subsequently re-posted on WattsUpWithThat, to high acclaim, of course. I used the excellent Climate Science Rapid Reaction Taskforce (CSRRT) to confirm and told the NGO they’d got the science wrong. They said no. I got a couple more climate scientists involved. On Monday I suggested they withdraw or delay the report. They said they couldn’t. First, very good of Gavin and Stephen Leahy to *try* to correct things before release. However I’m very confused how so many claims this extraordinary could have been missed by Dr. Canziani of IPCC 2 fame. Don’t things like this support the idea that IPCC puts politics ahead of science? 1. It is a damping effect for radiative forcings such as CO2 or aerosols or sun or volcanoes. It is not dampening for changes related to ocean dynamics – such as ENSO variability – which involve ‘sloshing’ of warmer and colder water masses across the Pacific. However, those kinds of rapid dynamical effects can’t give you large long-term trends. 2 .The drop was more like 0.5 deg C, and was related to an enormous forcing (-3 to -4 W/m2) related to the eruption of Mt. Pinatubo. If there hadn’t been any damping, the temperature response would have been much, much larger. In my original post you gave a slightly sarcastic reply but missed the point. You’re not thinking it through. Here you have a massive heat store (or cool store), its all relative. So, now go and sit in a large room full of ice and water. Add an electric fire for a bit of heat. How quickly does the temperature change? Now go and do the same in a room that is empty of water, insulated walls, just in effect the air. How quickly does the temperature change? First one changes very slowly, second one is quicker. Now how do you measure the inertia of the system? The answer is how quickly it responds to a stimulus. The problem with CO2 claims is that you can’t separate out the CO2 effect from a rise in temperature from natural variation. They are added together and its difficult to say what is due to what to give a given rise in temperature. However, for a fall, we can measure the response and although the CO2 effect is present, it reduces the fall. So the rates of fall give a minimum figure for the inertia in the system. You can’t do the same for a rise. So, the 1C drop over 3 years (including Pinatubo) gives a good indication of just how much inertia there is in the earth’s climate. You can include Pinatubo, since its just an effect that causes the climate to change. Why would you leave it out if you want to measure inertia? We have a lower bound. Now comes to the contradiction in your position. The inertia that is seen in your own temperature record is quite low. Otherwise the rate of change would be much slower. However, you’re also saying their is this huge mass of water and ice that must have a lot of inertia, and so the temperature changes must be slow. Given the contradiction what could we conclude. 1. The temperature record is very noisy, and the climate is changing very slowly. Very noisy in the sense of not being errors in measurement. 2. The thermal mass doesn’t participate that much in the climate. ie. Even though its thermal mass is high, its the atmosphere that has a lower inertia that is significant. Did you know that other people have already worked this out. Yep. They’re called climate scientists, and they get paid to do it, so they’d better be good. Tamino did a post on this. You have two components (at least) in the model, the atmosphere and surface, which come to equilibrium fairly quickly, but then exchange heat rather slowly with the oceans, which come to equilibrium on a timescale of ~30 years. It’s a very simple model that reproduces much of the behavior seen in terrestrial climate. As to your contention that we cannot separate CO2 from other factors. WRONG! Gavin, here’s why I’m not as charitable as you in my assessment of the NGO’s conduct in this case. We’re not talking about an innocent error that a sheepish NGO was willing to admit (are they even owning up to it now?). Based on what I’ve read at Steven Leahy’s blog and his related quote at The Science Journalism Tracker (which is reinforced by his comment #35 in this thread), it doesn’t seem a stretch for me to think the NGO went ahead fully aware that not all was right with their report. Based on Stephen’s comment here, it sounds to me as if he didn’t try convincing them all on his own–he involved a number of climate journalists, as well. Still they balked. What does that tell you? Were they just being incredibly obstinate? In denial? Or just maybe…did they think, what the hell. We’re going with it, truth be damned? I don’t know what was in their minds, but they got some explaining to do. I can’t tell you just how disappointed I am that you would betray ‘the team’ in such a way. That press release was a strategic move in implementing our One World Govt agenda and you blew it. I hope you are happy when all the WUWT and CA ‘skeptics’ come floding over here to praise you (ha!). Thanks Gavin, it may also avoid confusion to explain the third use of CO2-eq in the context of greenhouse gas emissions. In the context of emissions of greenhouse gases, “carbon dioxide equivalents” refers to the amount of carbon dioxide that would give the same warming effect as the effect of the greenhouse gas or greenhouse gases being emitted. It is normally used when attributing aggregate emissions from a particular source over a specified timeframe. It is used in this way at national and international levels to account for greenhouse emissions and reductions over time. For instance, Article 3 of the Kyoto Protocol states targets for emissions reductions in terms of “aggregate anthropogenic carbon dioxide equivalent emissions of the greenhouse gases”. For example, Canada’s net greenhouse gas emissions across all sectors in 1990 totaled 593,998,462 tonnes of carbon dioxide equivalents. Or perhaps the lay person who made the decision, being aware that the piece had been previously vetted by their expert, chose not to bother the 80-something scientist due to his being hospitalized, trusting that he had not boo-booed earlier. Keith Kloor is quick to assume the worst where an innocent mistake seems likely – what would be the point of the NGO purposefully issuing something so clearly erroneous, knowing that knowledgeable scientists around the world would be quick to shoot it down? You’ll want a good illustration of the concept. Pre-industrial CH4 was 700 pbb. So pre-industrial CO2-eq would be greater than 280. Presumably, this is less important than the other mistakes mentioned and its correction would not have helped much. Wait a second. That would indicate that one would subtract 280 ppm from the current CO2 concentration when calculating CO2-eq. That doesn’t seem right. Nice. Anyone curious if this is true or not is welcome to come over to my site and find an example. It’s easy. I have a search engine. Just plug in some of the most notorious names in the “denialist” hall of fame: Anthony Watts, Marc Morano, and Monckton, to name a few. See what comes up. Fact is, I’m an equal opportunity ballbuster–on my blog. I don’t get a lot of valentines. Oh well. As to the rest of your comment, I suggest you reread Leahy at #35. 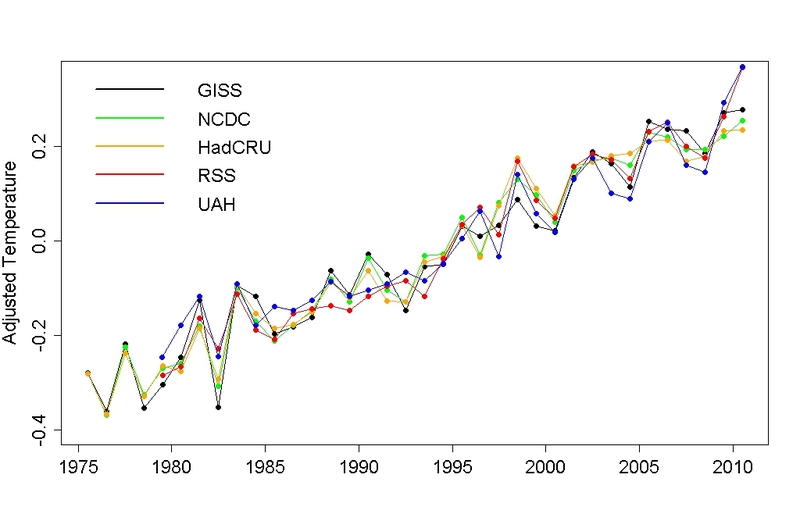 This is, um, “refudiated” by the observed effect that ENSO has on global temperature. The impact of AGW on food production is of course important. Therefore I appreciate their purpose. But AGW must be translated into regional weather impacts when one evaluates them. I wonder how they could do it without climate models with detailed spatial resolution. If they once looked into the IPCC data distribution center, at least, they could find the errors they assumed. Sure. But I’m just wondering how 490 CO2e in 2020 was calculated. 410 -> 490 means 80 ppm CO2e from other GHGs. It seems high to me. Don’t get me wrong. Blasting through 450 CO2e ppm is scary enough. But I do suspect their calculation of CO2e itself isn’t quite right. You need to consider the climate system as a partially buffered system. We have one component, land temperatures that has little intrinsic inertia, and an ocean component with substantial inertia. You could model this with two coupled differential equations, one for land temp, and one for ocean temp. Make such a model, with say .7 weight for ocean and .3 for land, and some degree of coupling. Then add a sudden forcing that would change the long term equilibrium by 1 unit. You will see that there is a short term response on a timescale consistient with the land inertia, and a slower (but larger) movement towards the new longterm equilibrium temp. So a change in forcing is not smoothed over decades, but has some immediate response as well. If you try that simple modeling experiment it should be sufficient for you to understand how the system behaves.